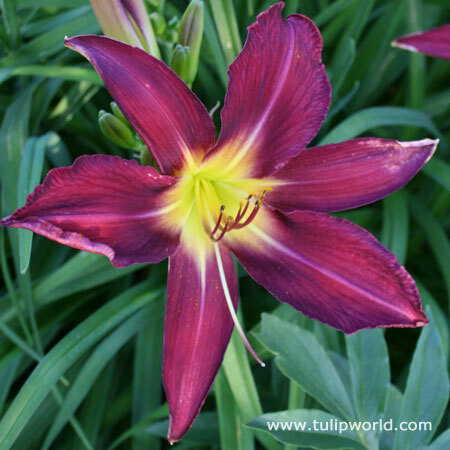 The Black Prince Purple Daylily (Hemerocallis) offers wildy exquisite, deep purple blooms which appear almost black and are accented with a bright yellow "eye" in the center. This fast and easy to grow plant comes as a bare root ready to plant in your garden to enjoy for many years to come as it is fully perennial in most zones and can handle quite a bit of abuse. Plant this unique plant in full sun to partial shade. Tip: Try planting this Daylily amidst other bright yellow blooms to make the flower centers really pop! Already has new green growth. So excited to see this bloom. The plant arrived already growing and in good condition.